In our July edition of our Preemie Family newsletter we learned about Amelia Faith McDermott, who was born at 26 weeks and 1 day, weighed in at 2 lbs. and spent 78 days in the NICU. Read more in an update by her mother, Mandy (who is also heads up the Irish Neonatal Health Alliance). My pregnancy in 2006 was deemed a high-risk pregnancy from week 13 when I began to suffer from unexplained haemorrhaging. From that point onwards the joy and elation of pregnancy was wiped out as each day was a waiting game to see whether my pregnancy would continue or not. Following several hospitalisations my placenta abrupted on the last day of week 25 of pregnancy and my daughter Amelia Faith was delivered by emergency section on Oct 8th 2006 weighing 780 grams. My memories of her delivery were of a rather frantic packed operating theatre, with several faces working around me and lots of people talking quietly but not to me! It felt like an out of body experience where I was observing the proceedings but not participating. Physically, my body shook throughout the whole delivery and as Amelia was delivered I distinctly remember the deathly silence as her little body was rapidly whisked away to a table in the far corner of the room. For 9 very long minutes the staff worked on her little body to breath life back into her and when they succeeded she was swiftly transported to the NICU. For me the surreal experience of delivering a preterm infant saw me laid bare on an operating table. My baby had been surgically removed from my body, I hadn’t seen her, I hadn’t heard her, I hadn’t touched her- I felt empty and so very sad and numb. My expectations of that initial cuddle had been shattered, my senses were longing to smell her , to see her, to breath her in but all that was left was an empty vesicle wondering if the experience of birth had actually taken place or would I wake up and realize that I had imagined it all. That feeling of existing in a parallel universe continued as I was transferred to a ward with 5 other new parents, all of whom had infants in cots next to their beds. All I could do was draw the curtains around my bed and pretend they didn’t exist. Listening to the other people on the ward discuss my “dead” baby as they referred to her was heart breaking. For me I was grieving the loss of pregnancy, birth and bonding. Following several visits to my bed from health care workers , arriving to examine my infant, I had to inform the nursing staff that it shouldn’t be up to me to have to explain to these staff upon arrival that my infant was somewhere else in the hospital (even I had no idea where my child actually was located other than some alien ward referred to as the NICU). 24 hours after delivery I was wheeled to this obscure place that my baby had taken up residence in. As we exited the lift I could see a set of double doors at the end of a very long grey corridor. A large foreboding sign on the door prohibiting visitors was the first thing that struck me about this place. One had to request entry using the bell (which as I learnt over the coming months would have to be rung on several occasions before entry was permitted). Behind these heavy doors lay my infant (apparently). After the rigorous hand-washing lesson had finished it was time to meet my baby. 10 incubators evenly distributed in the square room met my eyes, each surrounded with technical and loud machinery indicating the high level of care that these very small infants required. For me any one of these infants could have been mine and had the staff handed any child to me I would have been quite happy to accept what they had given me. My heart ached that I had carried this child in my body for 25 weeks yet now I was in the same room as her and I couldn’t identify her from her 9 colleagues!! Shouldn’t a mother be able to instantly pick out her child? Had my birth experience deprived me of the natural maternal instincts? Why did I feel an alien in this room? My memory of being introduced to Amelia was of hearing a list of the things I wasn’t allowed to do from a staff member. This compounded a situation in my own head where I had already failed my child by not being able to carry her full term, had failed her by not being able to give birth naturally and here again was another failure to simply be a Mum to her. I so desperately needed to feel that I had given birth, that I was a mother but what I experienced was akin to a school lesson where I was being told that, yes, this was my baby but from now on every single interaction that I would have with her would be vetted and approved by a stranger before I would be allowed to “be her mum”. Amelia was critically ill but to me she looked like a little baby that needed a loving cuddle – I needed a cuddle. 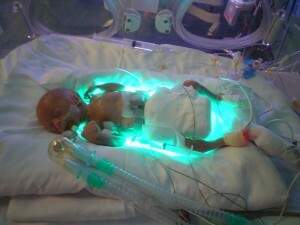 I could easily have removed her from the incubator and walked out of that NICU. My body was broken, my heart was broken and no one had asked me how I was feeling or what I needed. I was being assimilated into the NICU environment and it wasn’t an option. If I wanted to be part of my daughter’s life I had to obey the rules. What about the rules of motherhood, what about the ache in my heart ? What I really needed upon entering the NICU was for someone to tell me all the things I was capable of doing for my child. Having a preterm infant shifts the game rules but from outset prem parents need to feel that they can still be a family despite the environment. Becoming a partner in the NICU was something I longed for. Day after day I arrived at those big grey doors and waiting to be allowed enter the NICU to visit my baby. I was asked to leave for doctors’ rounds, which sometimes took over an hour. I would stand outside the NICU patiently waiting to be allowed back in. At no point could I say that I felt like Amelia’s mum. On occasion I felt “in the way.” The birth and my recovery from surgery were blurs in my mind. I wasn’t permitted the opportunity to heal physically or emotionally and I was expected to immediately move forward and become her daily visitor in the NICU and deny the past. Regrettably, I never felt an inclusive member of her care team despite numerous requests to be so and despite that 14 hours of every day were spent stalking her incubator in the vain hope that a nurse might permit some Kangaroo Care. The initial days of Amelia’s life were fraught with uncertainty, fear, loss and a bizarre sense of jubilation. Amelia’s condition remained critical for 7 weeks during which time she suffered from a Patent Ductus Arteriosis (PDA) which was medicated and closed over, lung secretions which required removal several times a day, several resuscitations, many infections, anaemia and non-functioning bowels. Her fragile skin bled when touched, she was ventilated for 4 weeks and unable to tolerate expressed breast milk for 4 weeks. She required 8 blood transfusions, required phototherapy, suffered from Bradycardia and Apneas , was administered caffeine to stimulate her brain and her prognosis was uncertain for quite some time. My expectations of motherhood had been shattered; I had lost 14 weeks of my pregnancy and was unable to perform the most basic task of motherhood-to hold my precious baby. The only care function that I could execute unaided for her was to express milk every 3 hours and that task had to be completed by the nursing staff who tube fed my daughter for 10 weeks. We spent every waking hour at her incubator and were rewarded by Mother Nature after two weeks, as we witnessed her fused eyelids open and view the world that had been transmitting sounds to her tiny brain. One of my cherished memories is that we were the first people that our daughter saw as she opened her eyes to this world. 28 days after her birth that included several near death experiences for Amelia and finally I was allowed to hold her in my arms. At last having watched a trail of people touch her, hold her, bath her, feed her, intubate her, change lines, etc., I could hold her next to my heart and apologise to her for all the failures. For me this moment was life changing for me, yet not one staff member was on hand to offer to take a picture for me. Here was my proof to the outside world that I had a baby and that I could hold her. If not for another parent in the unit I would not have any photographic evidence that this precious moment took place. Kangaroo Care was a rare occurrence in our nursery and during Amelia’s 3- month stay it only happened on 4 occasions. Ordinarily I’m not a quiet person but the experience surrounding the pregnancy and birth had exposed my vulnerabilities and I no longer had the means within me to speak out and ask that I be included in the cares of my child. I wasn’t alone though . . . all the mothers who shared the NICU with me were in a similar position so the fact that I felt that the practice of the NICU was abnormal in its exclusion of the family as primary caregiver only made me wonder if I was the only person experiencing the isolation and loneliness of a room filled with babies, mothers and healthcare professionals. The lack of consistency in the availability of Kangaroo Care, the conflicting information provided by different members of staff fed my flagging self-esteem as a parent. I began to feel reliant and dependant upon the environment of the NICU and by the end of our daughter’s stay in the hospital I felt totally unprepared for the outside world. 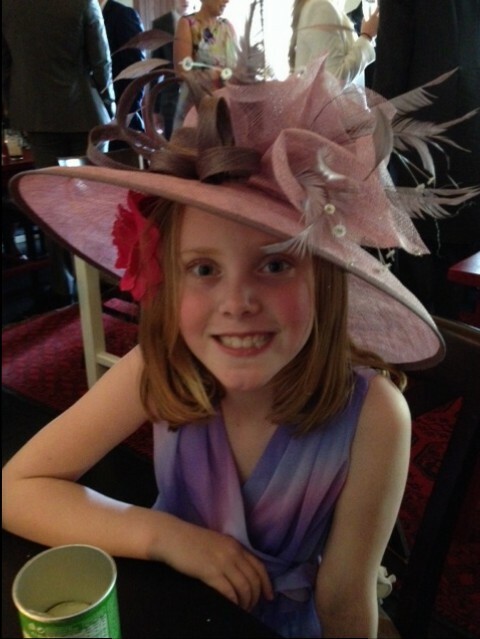 I longed to feel like a normal mum to Amelia but the need to keep her alive took precedence. Upon discharge from the NICU on Christmas Eve, I distinctly remember peering into Amelia’s car seat and pondering how on earth the medics thought that I was ready to take her home (I most certainly didn’t). At home, Amelia remained on an MR10 apnoea monitor for 5 months. Feeding difficulties, reflux, endless hospital appointments, apnoeas, RSV, worrying about illness and developmental issues became the norm in the subsequent months. The next 3 years passed by in a blur. My role was to protect my daughter, ensure that she took the required amount of millilitres of milk per day, pee’d X number of nappies , slept X number of hours. It all became a process of ticking boxes and at the end of each day I would collapse in a heap and contemplate repeating the process all over again the following day. Looking back on those days I didn’t feel like a normal Mother to Amelia. I had been conditioned to carry out various tasks that would ensure that she thrived but at no point did anyone allow me become her Mum. I was constantly observing her vital signs. My ultimate fear was that I would fail her again and that she would die on us. Every night I would kiss her good night and somewhere in the back of my mind was a little voice telling me that this could be the last night. I had forgotten how to relax. I had forgotten how to breathe deeply. For a full year after her birth I had a knot in my stomach, which I now identify as anxiety. Our family life became consumed by the various tasks surrounding our daughter. Our calendar was populated with hospital appointments, early intervention appointments, etc. and somewhere very early on we got lost as a family. I can honestly say that Amelia was 3 before I could refer to our little unit as a family. It was only at this point that I learned to relax in her company and looking back now I wonder did that small little baby sense my fears and anxieties in the early years as she was a very unsettled and agitated baby who never slept and had serious feeding issues. It had taken a very long time for us to acknowledge what had happened to us and to be able to move forward without the legacy of our NICU experience colouring our future. Amelia has undergone physiotherapy, occupational therapy and speech therapy. She continues to suffer from Chronic Lung Disease as a result of not receiving steroid injections prior to her birth. She developed a haemangioma on her left foot which has left her foot misshapen and discoloured . Consequently she has lost toenails and has an increased tendency to bleed. While her limbs are still hypertonic and her balance is compromised by her prematurity, she functions as a normal happy 5-year old little girl who loves ballet, singing and playing princesses. Every milestone she reaches is one step further from NICU, her battle to survive against the odds and the heartache and pain of our introduction to parenthood. Every day that Amelia shares with us is a cherished memory and serves to push the early painful memories of her birth further into the recesses of our minds. My advice to all health professionals who come in contact with families who have experienced a prem birth would be to recognize that not only does the baby require care but it is also vitally important to understand the trauma that has befallen this family and that by identifying the needs of the family very early on, one can begin the process of rebuilding a shattered unit which will ultimately benefit the infant in the long term.